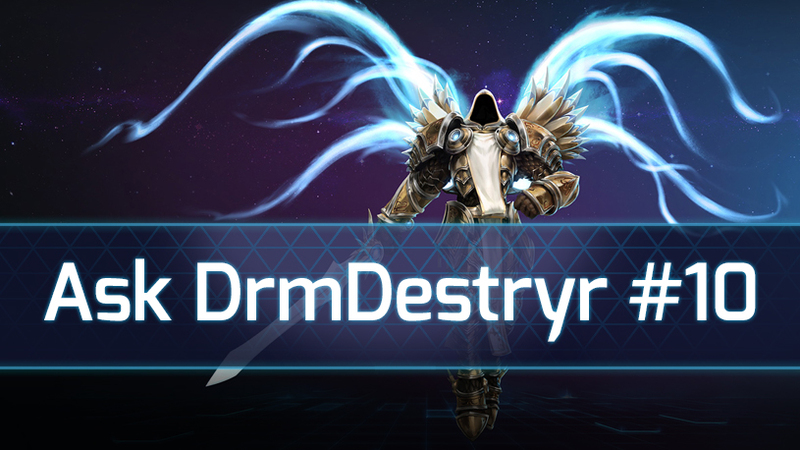 I missed your stream with Tyrael! :( How do you play him? Selflessly. You are a fallen angel, after all, but not in the sense of Christianity’s Lucifer and more in the sense of Milton’s Lucifer of Paradise Lost (check that sh*t out - it’s crazy good). Tyrael, if you haven’t played Diablo III, was the Angel of Justice and sacrificed his place in the heavens because he believed in helping humanity. Aside from now dealing with how to best stave off hunger, Tyrael helps Sanctuary remain relatively free of demons and other evil influences. So what does this have to do with how to play him? This, my friend, is the mindset you need to have when playing a support tank. If you go in there trying to make yourself the baddest tank to ever walk this side of the Nexus, you will be sorely disappointed. In his current state, the most powerful combination I’ve found involves buffing his Righteousness and his Smite – both of which benefit your team in some way. My favorite way to build him is to invest heavily in Righteousness because that crazy spell buffs everyone (minions included), so when you are pushing towers or sparring with the foe, spamming the heck out of Righteousness buffed with Salvation, Angelic Absorption, and Reciprocate is a fearful combination indeed. Though El’Druin is the source of many quests in Diablo, you cannot invest points into it as often as the other two. This is not to say it can’t be powerful, but it is to say that you should branch out and build your talents through buffing your team. E.T.C. seems like a cool tank. How can I rock? E.T.C. is the raddest character in the game if only because he literally melts faces. I wish I had that power (if only to endure horrendous experiments and be transformed into the coolest anti-hero ever). To be honest, I was very pleased to see just how powerful Face Melt is when used in conjunction with Powerslide. Akin to Diablo’s Overpower, you have to be smart when using it, though. With great power comes great responsibility. As fun as it can be to run at an enemy and then push them away, this does nothing but save them from fighting you and your team. My favorite tactic is Powersliding behind an enemy or enemies, stunning them just long enough to immediately launch Face Melt. This knocks them away from you in a circle so you do not have to be facing them for the effect to launch them away from the protection of their team into the angry swarm of damage dealers on your team. Don’t stay there, though. That would be stupid. As soon as you isolate an enemy, run back and help your team destroy them and then push forward together. With one person down, your team should be able to make a great advance. Unlike dear Tyrael mentioned above, you are a f*cking rock star and you need to confidence and balls to pull off playing selfishly successfully. You are the star of the show and set up the kills for your team. You certainly can’t kill all by yourself (you’re still a tank), but the positioning power you have is crazy influential and needs to be utilized to the max. So don’t play E.T.C. if you’re not Tauren enough to run into a mosh pit, punch some b*tches out, and then rock your way to glory.